View topic - Rush Coding Competition 2 (was: Fall Coding/Music Compo?) - Forums - SMS Power! Serioulsly, I plan to be ready with something modest for the regular compo in the spring. And judging by recent forum posts, we are all working on the same game: Lots of enemies, bullet collision, etc... haha. I'm in the same boat. I'd love to see a fall compo like that happen, but there's no way I could participate. I have even begun to pay attention to my regular day job lately. Well, if everybody reply that there's no way they could partecipate... of course better no compo than an empty one. And, no, I'm not working on a SMS shoot-em-up... sorry. I would be able to enter. And i wouldn't mind a mini-compo, even if just to get people posting a bit more. So, if it does indeed happen, i'm in. 25th November is a traditional deadline, a few months after the half year anniversary though. I would suggest to not abide by the bock birthday conspiracy and instead take note that July 8th is Maxim birthday! Maybe Hacks could be allowed for this compo as well? I would definitely love to try out new homebrew! I'll see if I can get something done by the 8th. I started yesterday evening. I'm really not sure what will do. Email them to the usual address so we can reveal them all together. ... are we going to be winners and last at the same time? Haha, glad you like the song. I was just having fun with major scales there. (I guess i could name the tune Major Fun, hahaha). I also worked on something else. 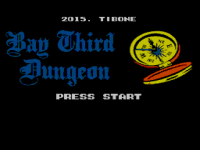 A full-mini-micro playable dungeon made with twee2sam. It is rushed as hell, but it should be fully working (tested a bit on KegaFusion and a bit on my SMS1). (this download has a map/solution sheet/references sheet, unlike the one i attached). Haha - sweet little package here! Also a good demonstration of smslib-powered c-coding. You get quite a lot of action from relatively few and comprehensible lines of code :) Congrats guys - and not least happy birthday Maxim! I thoroughly enjoyed both entries (and even solved the dungeon without any help or map). Congratulations to both participants ... and of course to you Maxim. tibone: Nice plot, really funny. :D I've encountered a few glitches but I guess it's not your fault. Can't tell where they occurred without spoiling. Credit must go to haroldoop for twee2sam, no coding required, just a bit of twee scripting and making the assets. Which is why i was able to do it. And yes, voting is not necessary, because either way, i would place first and last, haha. Is there any interest in the twee source code? I can post it, if anyone wants to take a look at it. 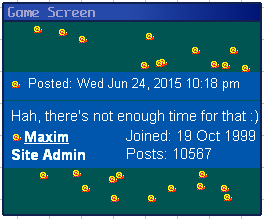 And because i forgot before, Happy Birthday, Maxim! Will play the entries soon, nice work! sverx: You didn't want to use your mass collision algorithm yet? sverx: Credit must go to haroldoop for twee2sam, no coding required, just a bit of twee scripting and making the assets. Which is why i was able to do it. Haha - a fun little adventure, with a simple, but rather catchy and well-fitting tune. I have not yet completed the game. I thought I was smart but ended up drinking poison, and in my second attempt I got lost. But I will eventually succeed :) I like the subtle Sega fanboy service, and hints to the mini-compo. Good job! So, did anyone caught all the anagrams for Birthday in the text ? And all the sms references?